Ideal for long transit runs. Operator leans against padded rail for comfort and stability. 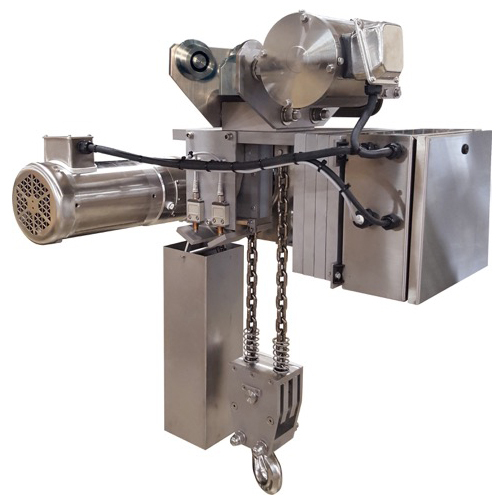 David Round offers a stainless steel air chain hoist for pharmaceutical and other cleanroom applications where there is no electrical power supply. Many Pharmaceutical and Food Processing manufacturing companies have come to rely on The David Round company for their clean material handling solutions. 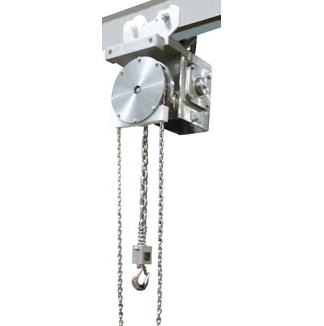 These hoists come complete with stainless steel gearbox casing and shafts along with hook and chain. The Food-Grade lubrication will keep this hoist running while keeping your environment and product clean. 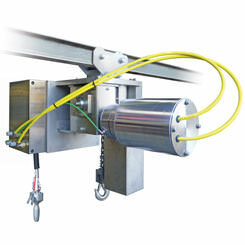 We also offer stainless chain hoists that are manual and electrically driven. The David Round Company thrives in cleanroom applications. We offer many stainless solutions, including jib cranes, trolleys, lift tables, floor cranes, and more. See our entire stainless offering Here!